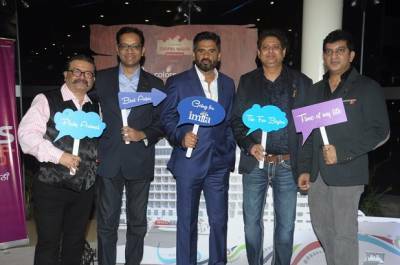 COLORS Marathi to bring alive IMFFA 2015 on the Mediterranean high seas. The 7 day awards’ extravaganza takes place on the Norwegian Epic Cruise from 25th October to 1st November, 2015. COLORS Marathi, the entertainment destination of the Marathi Manoos is at the forefront of redefining the scale of Marathi Film and Television in India. A preferred entertainment platform of every Maharashtrian, COLORS MARATHI is all set to create another landmark with IMFFA 2015. The mega celebration of Marathi film and television - IMFFA 2015 will embark on a new journey amidst the Mediterranean high seas aboard the Norwegian Epic Cruise starting from Barcelona (Spain) via Naples, Rome, Florence, Cannes; between 25th October 2015 to 1st November 2015. The 7 day extravaganza will transcend beyond a regular award ceremony to emerge as a platform that elevates the reach and presence of the Marathi entertainment industry. The itinerary will also include engaging initiatives like an Actors’ workshop by veteran directors Amol Palekar and N Chandra. This will be followed by a symposium on the road map for Marathi Entertainment with an elite panel of veteran’s Marathi film stalwarts. The symposium will culminate into a mega awards extravaganza to be held on 30th October 2015 while docked in the high seas of the French Rivera at the Cannes – The world capital of cinema. Audited by Ernst & Young, IMFFA 2015 will see the best of Marathi cinema coming together for the celebration. Colors Marathi is all geared up to celebrate the success of Marathi cinema with International Marathi Film Festival Awards – IMFFA 2015. The high octane awards will be amplified through a robust marketing plan targeted at entire Maharashtra using mass media like TV, Outdoor, Print, Radio and Digital. The plan will include a high decibel TV plan across top News and Music channels and Radio plan across top radio stations to build reach and frequency, an exhaustive OOH plan covering Mumbai, Pune and ROM markets for a period of 12 days. A combination of high impact media platforms like hoardings and tactical media like bus shelters, station boards and bus panels will be leveraged to drive viewership. This will be further amplified by launch day ads in leading print to achieve impact and widespread reach. Paid and Organic digital campaigns across Facebook, Youtube and mobile will add to the high decibel marketing campaign for IMFFA 2015.